New research proves that most pyramids, temples, and important structures around the world were built before fatal earth crust shifts. The orientation of many pyramids reveals former geographic poles. The proof that the correlations are not at all coincidental has been mathematically provided by us. Most pyramids are much older than was always assumed, way beyond our imagination. Determining the age of a pyramid is not as simple as many people might assume. Most believe that archaeologists are correct in their conclusions. But stones cannot be dated to determine the age of a structure because what the researchers invariably find is the formation date of the rock material itself, and not when the stones were used in the creation of a structure. Scientists believe they have found a reliable way to date stone structures when all they do is make associative, assumptive, and subjective connections between the organic materials found in and around the structures. They claim that this dating method is reliable, but there is no way for anyone to validate such a claim. We cannot associate one thing with another with absolute certainty. And that appears to be the major problem in dating any stone structure: validation of the dating methods. There is not a single validation possible to back up any of the archeologists’ claims. Academia, in general, is very sure about its dating methods, but our new mathematical dating method suggests that all dating of ancient structures, performed during the past several decades, is incorrect. Academia states that the most common way to date a structure is to carbon-date organic artifacts left by ‘builders’ found inside and around pyramids, or organic materials that slipped between the stones. This method of dating is believed to be fairly accurate. It is often claimed as ‘evidence’ regarding the age of a given structure. That appears to be a major mistake. According to the Oxford dictionaries, is evidence defined as the available body of facts or information indicating whether a belief or proposition is true or valid. The words ‘scientific evidence’ is often misused to emphasize a particular belief or to label a specific theory. We believe that the sun and the moon are the cause of tides on earth. However, how do we know that for sure? The only evidence we have are clear patterns between the moon phases, orbits, and the tides. From that, we can develop a theory which predicts what will happen next. When we can verify it multiple times with our senses, we might become even more confident that the theory is complete and correct. However, the final proof is the mathematical verdict that removes all doubts, whereas current scientific “evidence” only leads one in the direction of an alleged fact or a dubious statement. We have mathematically proven that the foundations of pyramids are hundreds of thousands of years old – we have real evidence. Our evidence is backed by indisputable proof that we express in probability. The probability that we are correct in our hypothesis exceeds 99.7%. That is a very high figure to start research. After we deepened our research, we ended up with a figure of 99,99987%. We have discovered that the orientation of virtually all ancient monuments, that are spread all over the world, form just a few giant orientation clusters around Greenland. The probability that these clusters are the result of a coincidental process is 0%. What the importance and meaning are of these typical orientation clusters is explained further on. If we can somehow relate pyramids around the world, can we then classify them into a certain period? Yes, it appears we can. And this is the first step to take before we dive into the intimidating mathematical details. We can do that by analyzing the orientation patterns of pyramids spread around the world. 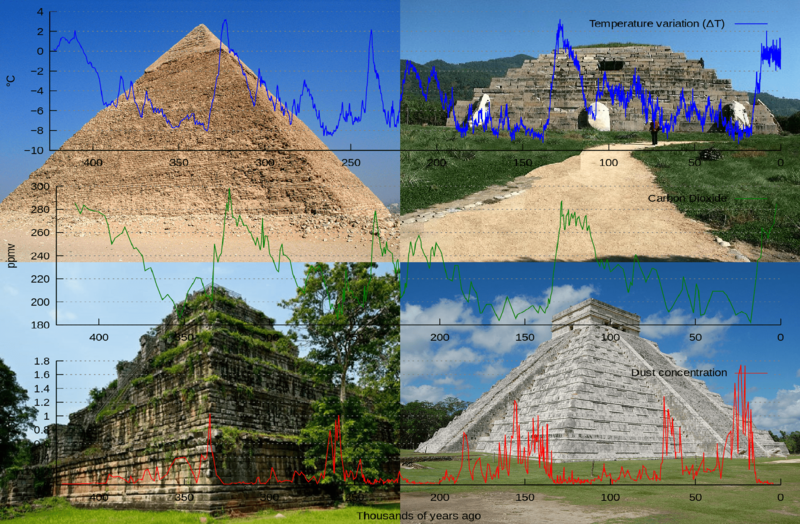 Examining the orientation of more than 910 pyramids and temples around the world made it possible to classify their foundations within specified time frames. The biblical and mythical deluges and the Ice Ages appear to be the same time-related event, as you will see further on in this article. And it even happened more than once in history. Some of our readers might have read Zacharia Sitchin’s translations of the Sumerian Tablets that also mention a series of deluges covering more than 400,000 years. That confirmation appears to be something more than coincidental. The time frames defined in these tablets seem to precisely correlate with the mathematical periods we have been able to extract from our data. Is there evidence of a Deluge? Yes, there is! We have overwhelming evidence for a Great Flood if we look at the effects the melting water of the great ice sheets had on the coastlines some 12,000 years ago. All coastlines flooded around the world because of this melting water. Around the globe, sea levels rose by about 120 meters. There are so many sunken cities all around the planet that it is easy to accept them as being older than 12,000 years. If such a deluge happened today, it would directly affect more than 60% of the Human population around the world. Virtually all cultures speak about deluges in their myths and legends. Whatever scholars want to say about native legends, most ancient tales contain a deeply hidden truth. As we will show in this series of articles, the most probable cause of the floods was Earth Crust Shifts. Every shift marks the beginning of a new ice age. We explain that, because pyramids have a square foundation, they can be used to find mathematical patterns in their orientation, especially when we examine them worldwide in large numbers. Note – when we say: North pole, we mean the geographical North pole. Our theory of Earth Crust Shifts does not deal with the magnetic poles. The geographical pole is the rotation axis of the earth. Fig. 2: The Giza pyramids are oriented to our current geographical North pole and therefore were constructed AFTER the “Great Flood”. They are older than 4,500 years and younger than 26,000 years. The Giza pyramids have been built with astounding accuracy, oriented to the current North pole. Their deviations beyond 0.06 degrees are not measurable. The statement that the pyramids of Giza are oriented to the current North pole (cardinally oriented) no longer makes the evening news. More important to know is that the Giza pyramids are oriented to the current geographic North pole and are therefore built after the Great Flood. This Great Flood was caused by an Earth Crust Shift, which ushered in the beginning of the last ice age. Our estimation is that the Giza pyramids are built between 4,500 years and 26,000 years ago. That means that nothing which is precisely oriented to our current geographic pole is older than 26,000 years. Fig. 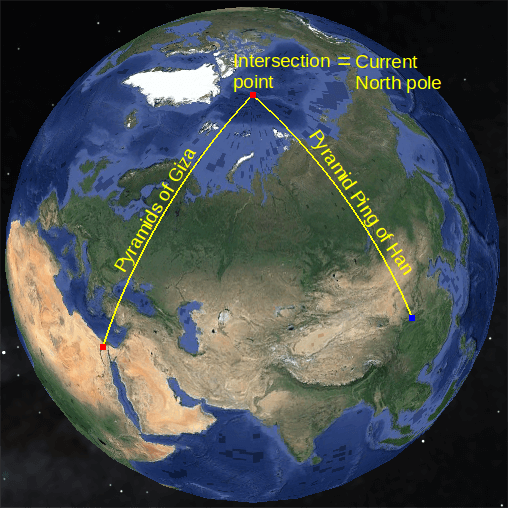 3: The orientation of the pyramids of Giza and the pyramid of Ping of Han intersect at the current North pole. They belong to the same time frame as Giza. Fig. 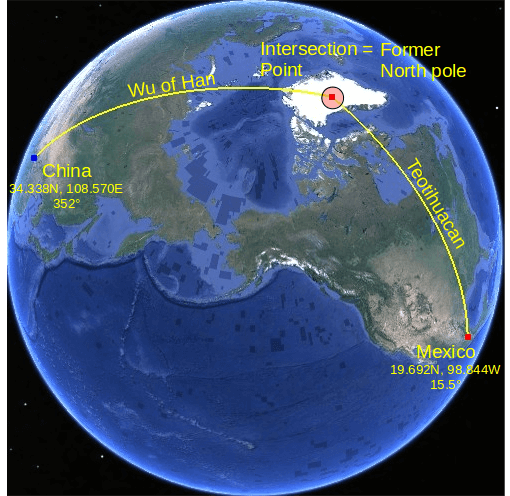 4: It is not difficult to see that some Chinese pyramids were NOT pointed to the current geo North pole, but to Greenland. This pyramid in China shown above is oriented at an angle of 8 degrees (352 degrees) West of North, namely towards Greenland. Were these pyramids built when Greenland was actually located at the North Pole? There appears to be a pattern, an overwhelming pattern. China has over 300 pyramids which are oriented in just a few groups. Most of the pyramids can be found in the center of China, near Xi’an. These are real pyramids, and it took scientists many centuries to figure this out. They call them “tombs” because we are simply groping in the dark what they were used for. There are people who suggest they were used to focus energy, but that is all very obscure for anyone to verify. Oriented at an angle of about -14 to -15°. Why are they oriented like this? The precision of the ones which are oriented to the current geographic pole is so exact that the other ones, which were oriented towards Greenland, suggest it was not something coincidental. But to prove this requires much more than just a few of these Chinese pyramids. That is why we collected as much data as we could possibly find. The 8 degrees-oriented Chinese pyramids massively converge on the same area of Greenland as the pyramids of Latin America also do and collectively they form an enormous mathematical node. The odds for this node to be coincidental, which we have named Pole II, is 1 to 1.82×1020, which is incredibly high. Thus, Pole II is proven with 100% accuracy and certainty. The different orientations of the Chinese pyramids imply that their ancient builder cultures had survived an Earth Crust Displacement. Crustal displacements moved the geographical North pole on Greenland to its current location. Greenland moved southward to an area where it starts to melt very slowly. There are pyramids in China which were built before the Great Flood and others after the Great Flood. The builder cultures somehow survived it, adapted, and built another series of pyramids oriented to the new, current geographic pole. This would mean that the pyramids oriented to the current North pole are of the same period as the ones of Giza, younger than 26,000 years. But the other pyramids, oriented with an angle of 8° are, by inference, older than 130,000 years. Yes, there is a huge gap between the stable periods of the geographic pole. The migration of a geographic pole took tens of thousands of years and wiped many advanced civilizations off the face of the Earth. Is this why the Chinese culture is so advanced in medicine, religion, philosophy, and many other areas because it is so old and their traditions survived the Great Flood? The whole perspective becomes most interesting when we go to Mexico. Fig. 6: The pyramids of the Moon (top left) and the Sun (bottom) at Teotihuacan. They too are oriented to Greenland. One of the most important aspects of scientific evidence is that it is reproducible and verifiable. In our case, it is gratifying that anyone can look over our shoulder and can confirm what we are doing. We talk in simple language. When we draw a line from the pyramids in China (oriented at 8°) and the pyramids of Teotihuacan in Mexico, the lines will intersect each other on Greenland. 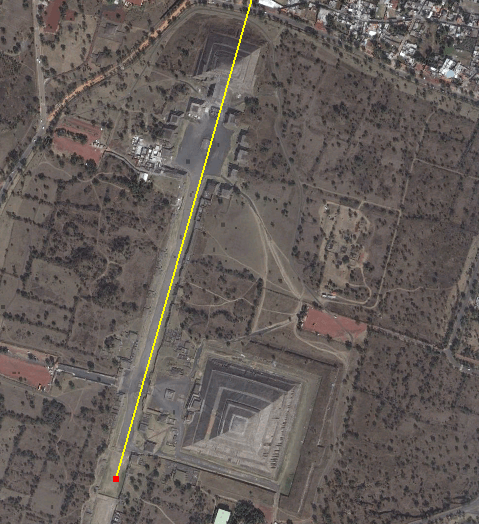 This is reproducible and verifiable by anyone who has access to Google Earth. Academia should ask this question, as we did: What could this mean? Read our article “Why is Greenland Covered in Ice?” again, and you will see clearly that the pyramids of Mexico and the ones of China were both constructed before the Great Flood. These pyramids were built when the North pole was still on Greenland – and that is a very long time ago. The earth’s crust appears to have shifted, as Hapgood suggested, only it did this in a latitudinal manner. However, the crust did not shift as wildly as Hapgood suggested. It shifted slowly over a period of tens of thousands of years. The cultures that built these pyramids are much older than we ever imagined possible. Fig. 7: The orientation of the pyramids in Mexico and China intersect each other exactly on the former North pole on Greenland. This is one of the former geographical North poles. By using this method with more than 552 ancient monuments, 4 former geo poles are proven. Only a few intersections, as shown above, prove little. It could be just coincidental. To rule out any coincidence, we have collected, examined, and processed the data of more than 910 ancient structures and sites. The results are staggering. It turns upside down all our treasured conventional beliefs regarding our ancient past in relation to the Earth. 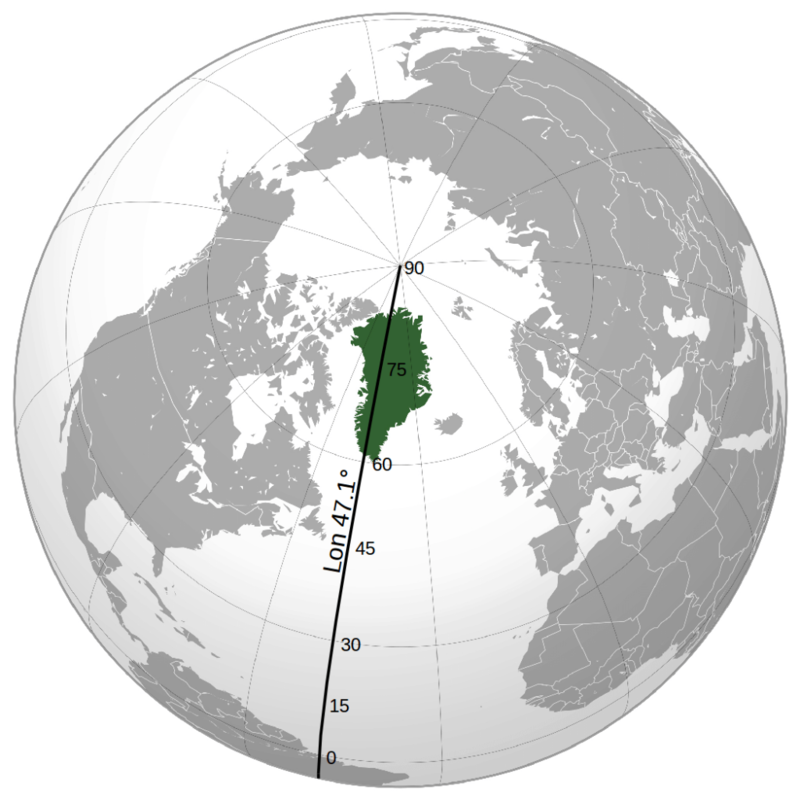 Since we already suspected that Greenland was once the location of a former North pole, we drew a line over Greenland from the current North pole to the current South pole, along a longitude of 45°W, and roughly calculated the number of intersections located on that preliminary reference line. The results were spectacular. Later in the process, the exact longitude of this line was calculated to be at 47.1°W. The results along this new line were even better. Former geographic poles clearly revealed themselves at several locations on Greenland. The probability of this finding can be calculated by using the binomial formula. With the user data set, and with the preponderance of found intersections, the probability of mere chance is less than 0.000000001%. The existence of former geographic North poles has a certainty of better than 99.999999999%. Therefore, this finding is one of intent and not a coincidence. In scientific terms: We can be sure this fact is true, and it has deep repercussions. As you will see, a puzzle starts to fall into place. The Earth’s crust has shifted in the distant past when the civilizations who built these ancient pyramids, temples and other structures, were already present and were flourishing. We are not speaking of a few thousand years ago. We are speaking of a timeframe spanning hundreds of thousands of years. We can safely claim that Greenland was repeatedly the location of previous North poles, without having any geological knowledge or evidence. We do not even have to go anywhere. We don’t need to walk on pyramids, or on glaciers, or to be a specialist in any of these areas. We do not even need a shred of ‘evidence’. We can now understand why Greenland is melting, and why we find so many mysterious sites around the world, and why these cultures disappeared. In our book, which is currently in the making, we will disclose the details of how the location of this intersection line is calculated at precisely 47.091°W, rounded to 47.1°W. The book will not intimidate anyone with mathematical equations forming the basis of our new theory. But there will be extensive appendices in the book, dedicated to the mathematics that supports our theory. Fig. 8: When we examine the number of intersections with the North-South line, we find the former North poles. That line has been calculated at 47.091°, rounded to 47.1° for practical reasons. It delivers 100% proof – mathematical proof. This is obviously correct, and it sad that Science refuses to accept this. Both Teotihuacan, and Chichen Itza, for example, point toward Greenland, which doesn’t necessarily mean that they are older structures than we thought…only that they were built ON TOP OF the “truly old” structures, or at least they were built to respect the orientation of the older structures they replaced. “Newer” constructs like the Giza pyramids were built to respect the “new” North Pole, but I would wager that the further down we go in Egypt, the more temples will point toward south or central Greenland. So, the cataclysmic event that killed off the Megafauna, and the Antlanteans, at the SAME time….12,000 years ago or so, ALSO must have changed the location of the poles…and that shift caused the Sahara Desert and Egypt to become closer to the equatorial bulge and started becoming the dry arid places they are today (but weren’t then). Also when you look at ANY map of the last glacial maximum, you can see that the “circle” of ice is perfectly centered around Greenland…NOT the north pole. This perfectly explains why Siberia was not so affected by the glaciers, and this is also the reason why Antarctica is seen on truly ancient maps, but not on newer ancient ones….Antarctica was not centered on the South pole. One of your problems is that you have chosen ‘grid’ north as one of your points of reference. This is an arbitrary point on the globe and has no relation to geodetic north or true north (spin axis north). The true pole actually moves with time. This is called True Pole Wander (TPW) in science speak. Currently this drift is circa 10cm per year though has accelerated maybe to 25cm per year. The main cause of this currently is the melt from the last glacial Maxima – as the earth is not water symmetric i.e. the Pacific ‘side’ gets more weight added than the land mass ‘side’. This offset alters the spin axis slightly until a new equilibrium is reached. So your “47deg line” really should ‘end’ on the current true pole – meaning it will not be 47deg anymore. I do think a pole centred over Greenland/Baffin Island during the last ice age makes more sense as this explains the ice extent far better i.e. Siberia is ice free and would have allowed for the large populations of mammoth on what would have been fertile grass lands. The current pole position has made these lands cold hard tundra for 8 months. I just wonder if whatever caused the large melt water pulses circa 13/11kya released enough water to speed the TPW up so rather than the pole taking many many thousands of years to move it did so over several hundred years or a few thousand. Thank you for your comment, John. We haven’t chosen a grid of reference to begin with, on the contrary, they are formed by the orientation extensions of randomly located ancient structures around the globe. In fact everyone with enough patience and insight can verify what we have done. Of course there are still a lot of questions to be answered. One thing is certain with a very high probability, and that is that the sequence matches the sequences of the ice ages. The most likely time frame is therefor 350,000 years, and not the short time frames of just a few ten thousand years. In fact the short time scales explain nothing, they make things only more unlikely to be correct. The likelihood that the crust shift over a very short period of time is very low. It is simply too large for that to make that happen. These large crustal deformations take place over a period tens of thousands of years. On top of that are there periods of tranquility, like now, and periods of turmoil. This makes it more difficult to understand what happened in the ancient past since we live in a tranquil period. Nothing is more incorrect than the assumption that we can interpolate simple measurements into a far future and a far past. The events are non-linear so to speak. Great work. And what about Bosnian pyramids, Is there any measures for them? Thank you, Hrvoje. The Bosnian pyramid is, if it is a real pyramid, a relative simple case. The base of the pyramid seems to be oriented to our current geographic pole hence is younger than 26,000 years. Tunnel systems and constructions underneath the top construction might be much older however. Dating through 14C of these older parts might be impossible, because they can easily be older than 60,000 years. Orientation has proven to be a very good tool to date the original age of foundations. Enjoyed every bit of your article. Thanks Again. Want more. Thank you for your comment, James. The proof is overwhelming and unambiguous that Homo sapiens and Homo erectus and Homo neanderthalensis were all capable builders. If you have told people this for decades, you were right all along. Very interesting! I think it is a significant method. Do you have an online downloadable database of pyramid locations and orientations so others can check your work? Thank you for your comment, George. The data is the result of many years hard work. We have spent thousands of hours of research in this project, and there is no reason for us to toss it open on the street. Why would we do this? Only a few weeks ago we have upgraded our website and introduced the possibility for donations. And this will cover only a fraction of our already spent costs. Checking this kind data can’t be done by just some volunteers, as you seem to suggest. This work requires many hundreds of hours of a skilled mathematician, and that work is already done. The data is checked, readjusted, and tinkered many times by our team. The results are available and for everyone to see – for free. There is still a lot of awesome stuff in the pipeline.